What do you do when you are bored in an American Airline's Admiral's Club? I dunno about you, but I sample the food. Of course, there isn't really much offered in most Admiral's Clubs. But in LAX, the lounge is divided into two sections, and the Flagship Lounge has Pepperidge Farm Cookies. I guess they are considered premium? I am not really much of a cookie fan, at least compared to other desserts, and these didn't look great, but, I was bored, so I decided to try them all. I'm not one who grew up with packaged cookies, Pepperidge Farm or otherwise, so I don't have fond childhood memories of these cookies, although I know many people do. That isn't to say that I didn't have cookies, I just had fresh baked cookies at all times, because my mother was a baker. But all those classic packaged cookies, Pepperidge Farm, Chips Ahoy!, Keebler ... they never found their way into our house. Of course, somehow over the years I've encountered Pepperidge Farm cookies a few times, perhaps at parties or friends houses. When I started my job, our microkitchens were filled with Milanos. I remember always thinking the bags looked fancy. But I still had no real memory of what these cookies were like. It turns out, there was a reason for that. They are just not memorable cookies! My curiosity has been satisfied, but I won't be going out to buy any of these anytime soon. Speaking of curiosity, I always look up information about a company when I write a post, and I learned that Pepperidge Farm is owned by the Campbells Soup company. Random, right? But maybe that is why people think of pairing Goldfish crackers and tomato soup? Anyway, the assortment placed out in the lounge seemed to be the "Classic Favorites" assortment featuring 6 different cookies. I tried them all. I started with a Chessmen. 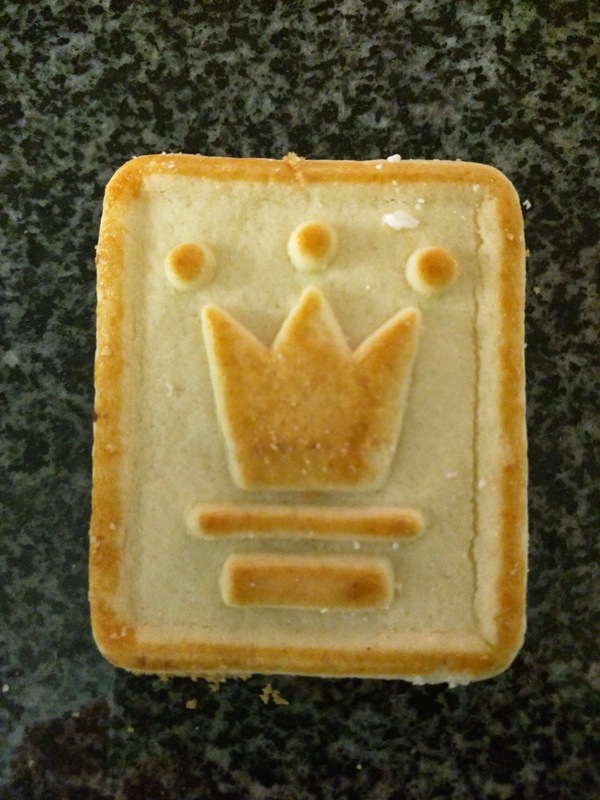 I guess Chessmen are just simple shortbread? But this wasn't nearly as buttery or decadent as a shortbread should be. It crumbled very easily. Plain and boring, my 3rd pick of the 6. Next the "bordeaux". The name told me nothing about it, so I had no idea what to expect. What on earth is this thing? It was super thin and crispy. It almost seemed burnt, but perhaps this is the desired taste and texture? 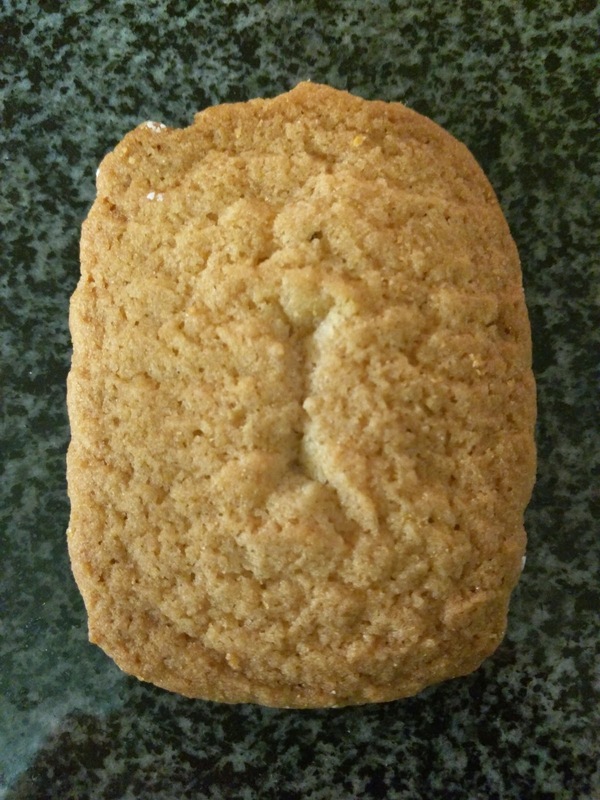 Why on earth would you ever want such a plain, crispy cookie? I'd promptly turn these into a tart crust, or at least slather them with ... something. Next I went for the "Lisbon". 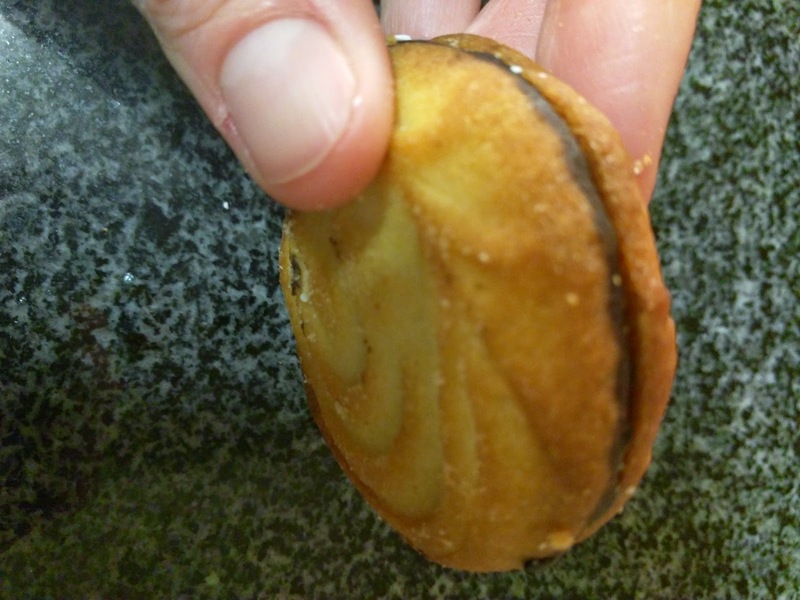 It seemed to be a chocolate chip cookie, dipped in dark chocolate on one edge. It isn't listed on the Pepperidge Farm website, so I think it only comes as part of the collection. 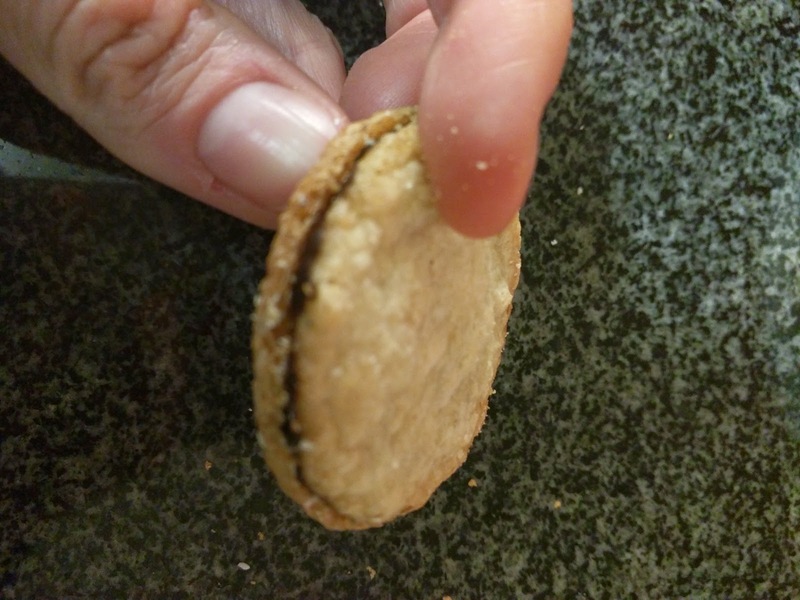 It was ... a plain, boring, crispy cookie, with bits of chocolate inside that were too small to taste. Definitely not for me, my second to least favorite. 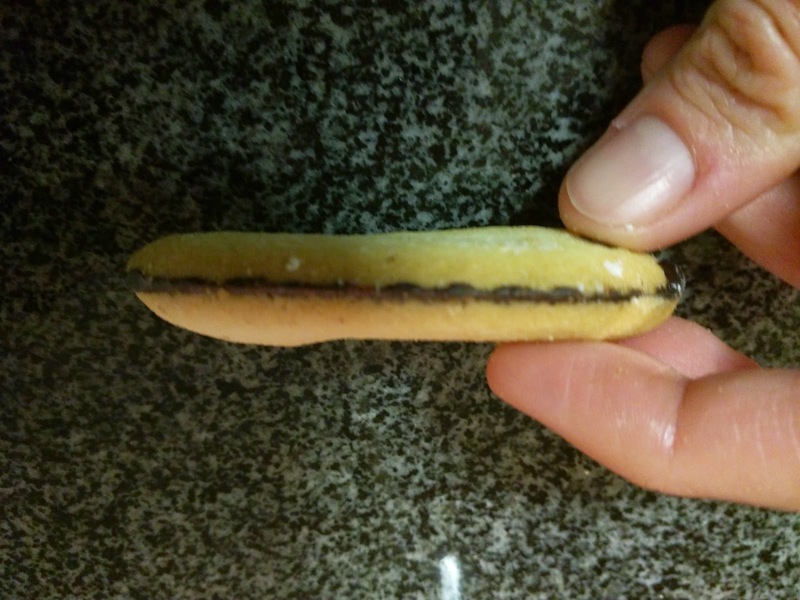 "Ah, the classic Milano cookie. Simple. Elegant. The perfect balance of exquisite cookies and luxuriously rich chocolate—in irresistible varieties to match any mood." Just slightly better than the Lisbon was the Milano. Seriously, all these cookies are just so boring. The chocolate filling placed the Milano above the Lisbon for me, but even then, there wasn't nearly enough chocolate to really taste or be interesting. 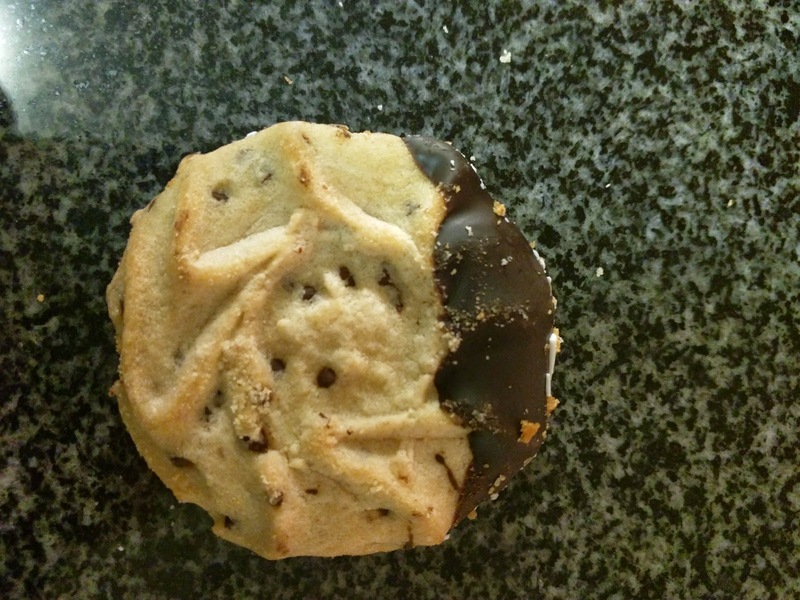 "A Brussels cookie is a celebration of contrasting textures. Lace-thin, crisp cookies embrace a layer of smooth, luxurious, dark chocolate"
Ok, this one was at least interesting. It was super crispy in a good way, and almost seemed ... fried? It was fairly decadent. My second pick. The Lido is another one not listed on the Pepperidge Farm website, no longer available on its own, but still part of some samplers. It seems to be buttery shortbread cookies filled with chocolate. Sorta like a Milano, but round, and with better cookies. My favorite of all that I tried, but I don't really have any interest in having more of these. A few weeks ago, I dined on Claude Lane for the first time. I've walked through that area a zillion times, yet never stopped to eat, probably because many of the establishments are only open on weekdays. Claude Lane is a peculiar place, basically just an alley, but a "lane" sounds so much cuter. And, when the restaurants are open, it really is pretty cute. They each set up outside seating in the lane, and then, it really is much more than an alley. My first visit to Claude Lane brought me to Claudine, where I had, quite literally, the best crème brûlée of my life. 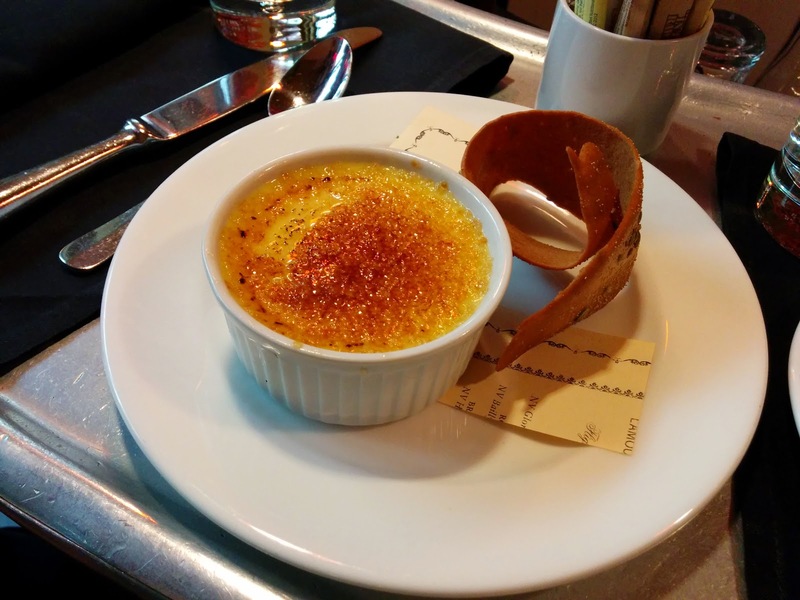 And if you know me, you know I love desserts, particularly puddings or custards, and crème brûlée is one of my ultimate favorites. Impressing me with a crème brûlée is no easy feat, and Claudine blew me away. So I returned to Claude Lane on a Saturday afternoon, this time dragging Ojan with me. We could not return to Claudine, as they are only open during the afternoon on weekdays, so we choose their sister restaurant, Café Claude, located across the alley. Both locations serve up classic French cuisine, but just like when I went to Claudine, I had eyes for only one thing: dessert! 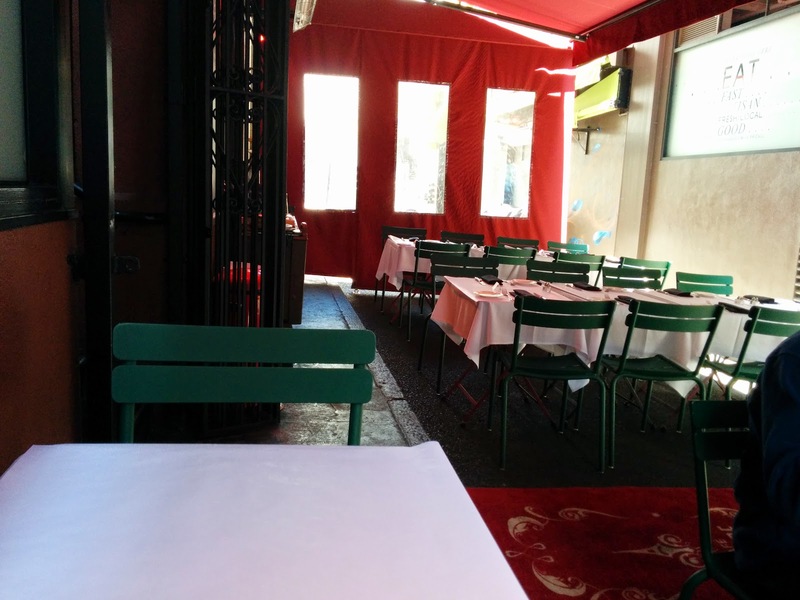 Café Claude has a generous seating area outside, under a red tent. Since it was a bit cool out, on our first visit, we ventured indoors. Inside are small tables, mostly just 2-tops, all set with white tablecloths and cloth black napkins. A bit more formal than I was expecting. The restaurant wasn't very full, but when I said we'd just like dessert, we were told that only the bar seating was available. This was fine with me, as I loved the bar vibe at Claudine. The bar area at Café Claude however is clearly a second class citizen, and honestly, one of the least comfortable bars I've ever sat at. It had no overhang at all, so it was impossible to get close to the counter. There were no purse or jacket hooks, so my belongings had to sit on the floor. The bar stools were nicely padded however. On my next visit, it was a nicer day out, so we sat outside. I was seated directly under a heat lamp, which I hadn't noticed on my first visit, and makes much more sense given San Francisco's weather. That is the secret to making the lane seating usable! Another thing I loved about Claudine was how open, bright, and airy it was. Café Claude was again the opposite in this regard. Although the walls are painted yellow, there is very little light inside, as the only windows are on the front entrance, facing the lane, since both sides of the dining room, and the back, are all enclosed by other buildings. It felt very dark. The service was friendly enough, and I liked being in the bar area to watch the drink orders come through. I'm always a bit fascinated to see what people are drinking at 2pm. Most were opting for coffee drinks, although a few did go for wine. Like Claudine, Cafe Claude accepts PayPal for payment, but unlike ever other time I've used PayPal, it did not work smoothly on my first visit. The PayPal app was really acting up. I wasn't able to log in, a necessary first step. I killed the app several times, toggled airplane mode on and off, and eventually got it to log in. I thought my woes were over, as I received my paper bill, typed in my special code, and my order showed up. I could easily split the check if I needed, and add my desired tip amount. Everything looked fine, and I hit the button to pay. The app told me to check with my server that it had gone through, so I did. And ... no luck. I went through the whole process 3 more times. Same result. Pulled the bill up fine. Added tip fine. Hit the payment button. Same strange warning to make sure it worked. Sigh. So I killed the app again. Fought with login again. Typed in my bill code again. Added the tip again. Hit submit. And this time, the app told me it was successful, but I still verified with the bartender. It worked, but it really was not a smooth experience. It seems like it was likely a PayPal problem, but this is the first time I've ever had trouble paying with PayPal, normally it a time saver. On my subsequent visits however, it worked without a problem. I think PayPal was just having issues on that first visit. Anyway, the desserts were well made. I didn't love any of them, but mostly due to my own preferences. I think their pastry chef is talented, and I appreciated aspects of each dessert I tried. I may have been at Café Claude for dessert, but if you've ever dined with me, you know how much I love pairings. In particular, I always love a bitter coffee to compliment my sweet dessert. Since it was later in the day, I went for decaf. It was pre-brewed, just poured for me out of a carafe. It was ... fine. Served nice and hot, which I appreciated, with a small glass on the side filled with assorted sweeteners, and the offer of cream to add. I added nothing, which means, it wasn't too bad. I prefer my coffee black, particularly when pairing with dessert, but often decaf is so bad that I have no choice but to add sweetener and milk. The timing was also perfect. I was able to enjoy a few sips before my dessert arrived, but it didn't run out before my dessert. 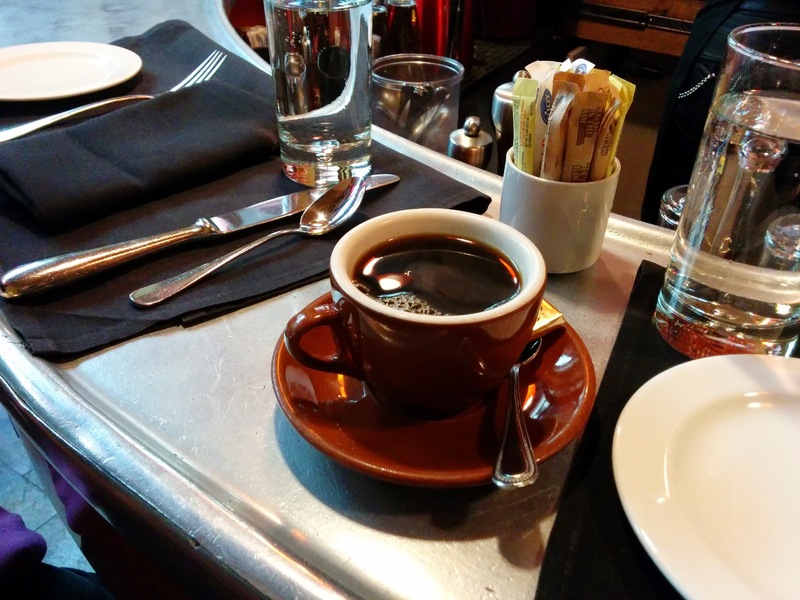 I get pretty grumpy when I specifically order coffee intending to pair it with my dessert, and it arrives immediately after I place the order, which is nice in theory, except that it is long gone, or stone cold, by the time my dessert arrives. Or, if it arrives after my dessert, which I do sorta understand, as I'm sure some people like it to conclude their meal. Anyway, this timing was perfect. It is hard to see in the picture, but also on the saucer was a small chocolate, Café Claude branded. A nice touch! So overall, it was fine, and I appreciated having coffee with my dessert, but there wasn't anything special about the coffee. The cup was really small though, I found myself wanting to ration it. Price was fine, particularly with the inclusion of the chocolate! And for the main event, my precious crème brûlée, which the menu proclaimed was "made with 'bourbon' vanilla bean". The first thing I noticed was the different size serving vessel than the one from Claudine. There, it was in a wider, more shallow dish. Here it was in a classic crème brûlée ramekin. I quickly realized part of why I loved Claudine's version so much - even if there was the same amount of pudding, in a more shallow dish, you have more surface area, and hence, more of the caramelized top. And, that top is an essential component of crème brûlée for me. Now I wonder why this style is the standard ramekin used? But back to my crème brûlée. I first performed the standard "tap test". It stood up to my spoon tapping, then easily broke into pieces. Not bad. I then did the "temperature test". Yes, the top was still a bit warm, and the rest very cold, indicating that it had been freshly brûléed. Another point. You'd be surprised how many places get even these two basic aspects wrong! As I said, it passed the tap test, but the topping wasn't as thick as I'd like it. Claudine did this aspect better. What was there had a good caramel flavor, not burnt, but there wasn't enough for my liking. And, as I noted, the smaller top surface area decreased the amount of topping in the first place. Ojan was with me on this visit, and he took the first bite, and said, "yup, it tastes like pudding". I rolled my eyes, thinking that he always says that about crème brûlée, or any other pudding-like dessert. However, in this case, I absolutely agreed with him. It tasted like vanilla pudding. Good vanilla pudding for sure, but, it was lacking the custardyness and thicker consistency that transforms pudding into crème brûlée. Since there was so little topping, and it was really just a pudding, once I thought of it as vanilla pudding instead, I did enjoy it, and it was very, very creamy. But, a great crème brûlée it was not. I was also a bit disappointed by the vanilla component, as I always prefer to actually see flecks of vanilla bean throughout. You may be wondering what the thing on the side of the plate is. We were too. The menu description did not indicate that it would come with anything. I tried a bite plain to figure out what it was. It was a rolled up cookie, with a taste and texture that reminded me of a waffle cone. Slightly sweetened, easy to break into pieces, and very thin. But it was coated in seeds, making it look almost like a cracker. I think they were anise seeds, but it might have been fennel. Either way, the flavor was strong, and very savory. A bit of a strange pairing with the crème brûlée. But ... I did really enjoy breaking off pieces of the cookie and dipping it into the pudding. It filled the void that thicker chunks of caramelized topping would have filled. I also appreciated serving crème brûlée with something besides just a few token berries on top. I think if they changed up the spicing on the cookie, this could be a very successful pairing. The $8 price was fine, and I enjoyed it as pudding, but the version from Claudine was in another league entirely. I think I need to go back there soon! On my second visit, since it was a warm day, I went a iced coffee instead, again decaf since it was afternoon. It was again served with a cup of assorted sweeteners, and a little pitcher of milk. No chocolate accompanied this one though. Like the hot coffee, it was highly unremarkable. Not particularly good nor bad. 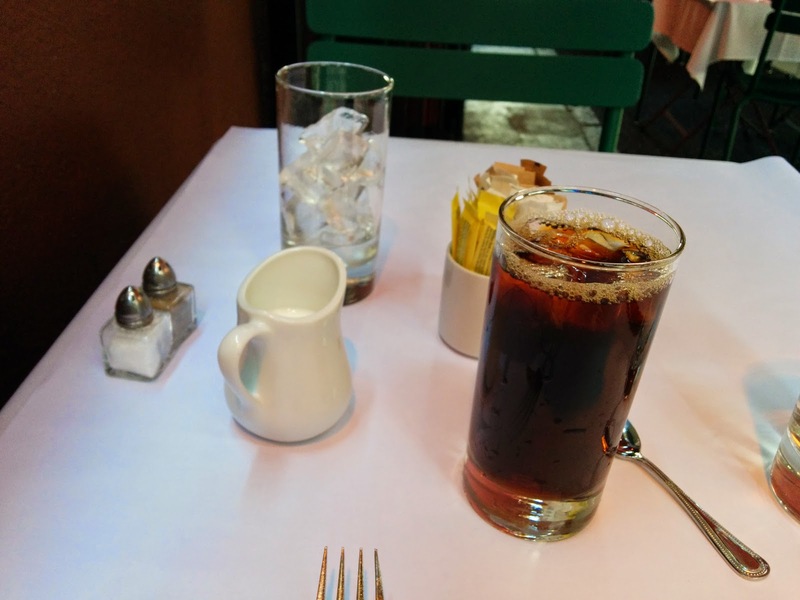 The server noted that the ice was melting quickly when he added it (since, they just poured the hot coffee over ice), so he brought me an extra glass of ice that I could add. A very thoughtful touch! On my second visit, I knew that I wanted to branch out from the crème brûlée. I'd been eyeing the menu for a few weeks, and had my heart set on the pain perdu, a custard soaked brioche, with strawberries. Oh yes please! I was a bit devastated when I arrived, and found it no longer on the menu, even though it still showed on their online menu. There was still a strawberry dessert, but, alas, it was a tart. I never really care for tarts. Besides the crème brûlée, there were two chocolate options, but I try not to have chocolate late in the day. Which left me with only one choice: the paris brest. Paris Brest is normally filled with praline cream, and isn't very high on my list of pastries. I was thinking of maybe picking the strawberry tart instead. Or just going for the chocolate mousse. But I asked my server for advice, and he told me the paris brest was fabulous. And, it wasn't a typical paris brest, as the description said: "pâte à choux, lavender & mascarpone diplomat crème, blackberry coulis, almonds". While it include almonds, it didn't really sound like typical praline cream. So, I went for it. Service was fast, my dessert arrived quickly, with a friendly "bon appétit"! 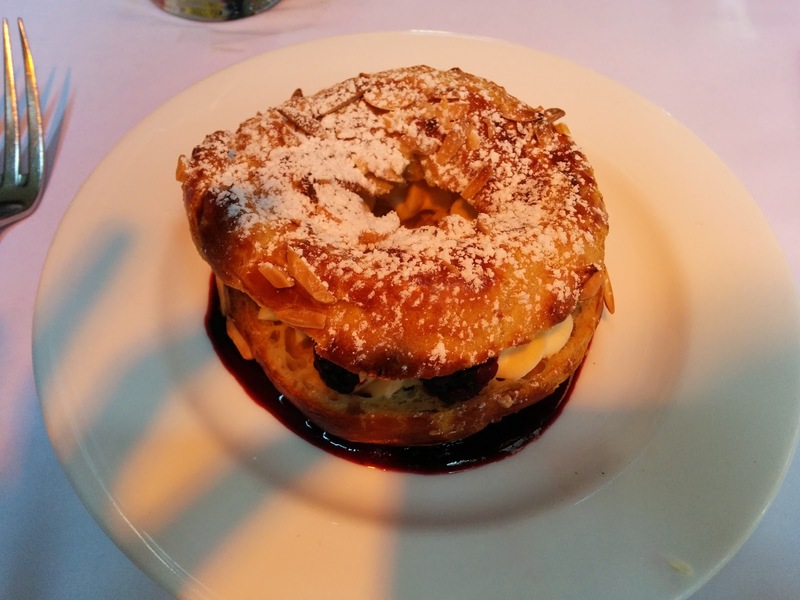 It looked like a typical paris brest, a pâte à choux ring, sliced in half, filled with cream. The pâte à choux was ok, but, is one of my least favorite pastries, as it can often be fairly eggy, in a way that I just don't care for. And sadly, this was eggy, and a bit soggy. The very top was crispy, and I liked the crunch from the almond slivers on it, but I didn't care for the bottom. The ratio of pastry to filling seemed off, just way too much pastry for the amount of filling, but, that is likely just because I didn't like the pastry. Inside was the cream, certainly not a standard praline cream. The menu described it as lavender & mascarpone diplomat crème, but it was very, very thick. Diplomat cream is normally made by mixing pastry cream and whipped cream, resulting in a lighter filling than standard pastry cream, so that is what I was expecting. This was much thicker, presumably due to the mascarpone? I didn't love the texture, nor did I pick up on much mascarpone, but the lavender was fairly remarkable. Lavender can be so dangerous. A little too much, and it tastes like soap. The lavender here was applied expertly. Subtle, but you could still taste it, but certainly not overwhelming. It also wasn't too sweet. Also inside with the cream were a few blackberries, which, are one of my least favorite berries, due to the seeds. I can't stand the seeds, and these were no exception. When the server described the dish to me, he said raspberries, not blackberries, even though the menu did call out the blackberry coulis. Speaking of the coulis, the whole thing was sitting in a pool of berry coulis. Like lavender, another element that so often goes wrong. When is the last time you had a coulis that wasn't just crazy sweet? Well, Cafe Claude got this component right too. It was sweetened, for sure, but it wasn't sickeningly sweet. It tasted intensely blackberry flavored, but was strained, eliminating the seeds that I hate so much. Beautiful flavor, very balanced, and the combination of the blackberry flavor and the lavender was really quite extraordinary. So, did I like this dessert? Actually, no. But, in this case, I think it is entirely my fault. Cafe Claude nailed the difficult aspects of the dish with the lavender and the coulis, what I didn't like was the pastry itself, which again, is normal for me and this style. It could have been a great choux pastry, it doesn't matter, when I just don't care for the taste. I did enjoy some bites where I just scooped out the cream and ran my spoon through the coulis, appreciating the creamy component and the balanced flavors. On my final visit, I just wanted to pick up a dessert to bring to Ojan, who was home sick. I was disappointed that the menu hadn't changed at all since my last visit. I was hoping summery, seasonal creations would have made their way on to the menu. I didn't think crème brûlée was best for takeout, and I knew that Ojan would love the molton chocolate cake, but that certainly wasn't the right choice for takeout either, so I was left with the paris brest again, or the tarte au fruit. I didn't like the Paris Brest, so it was an easy choice, particularly as the tarte au fruit sounded promising: "Almond frangipane tart, seasonal fruit, chantilly." Of course, I say this was for Ojan, but clearly I intended to steal a few bites. I was disappointed when it arrived. Not by the presentation of course, as they did a really nice job of plating it up, even for takeout. Berry sauce on the bottom, fresh raspberries alongside, scoop of chanilly cream on top, dusted with powdered sugar. No, what I was saddened by is that it looked like clafoutis, not the fruit tart I was expecting. 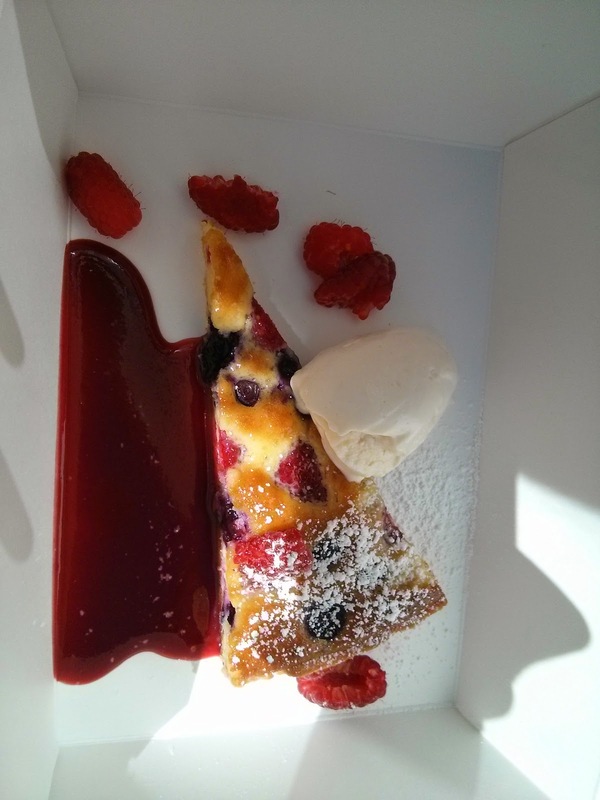 I thought it would be a tart shell, with a layer of frangipane, plenty of raw fruit, and fresh chantilly cream. This was cakelike, the fruit was cooked inside. There was a tart shell. I don't really have much to say about this, as it just really wasn't what I wanted. Maybe if you like this sort of desert it was good. There wasn't anything wrong with it, but I really just didn't want it. I ate a few bites of fresh fruit, the tart shell, and some cream, and Ojan had the rest. He seemed to enjoy it. I did appreciate the size, it was actually the appropriate size for one person. The $8 price would make sense if dining in the restaurant. I'll be waiting for a menu change up before I return. 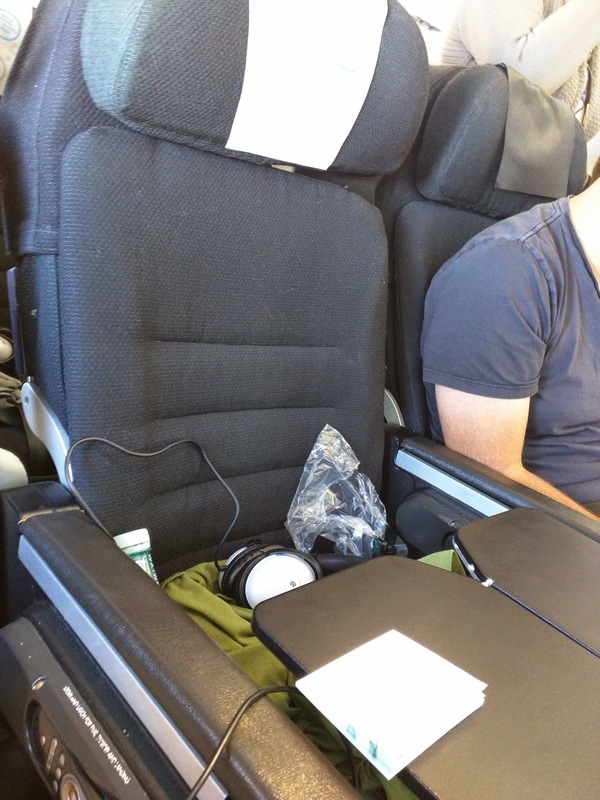 As you've been reading about on Travelin' Tuesdays the past few weeks, I recently went to Sydney, flying on Air New Zealand for the first time. I had a very enjoyable business class flight from SFO to AKL, where I managed to really truly sleep for the first time on an overnight flight. That bed was magic. Then we hopped in Auckland, where I got to have a delicious second breakfast in the lounge, before boarding a 3.5 hour flight over to Sydney. That flight was rather lackluster, but, it was real business class, so it wasn't too bad. The return trip was a bit different. While our long haul was still going to be business class, the flight from Sydney to Auckland, NZ704, was aboard an A320, a single class aircraft. We obviously would have picked a business class option if there was one, but Air New Zealand only operates one aircraft with regular business class a day on that route, and the flight was earlier in the morning than Ojan wanted to fly. 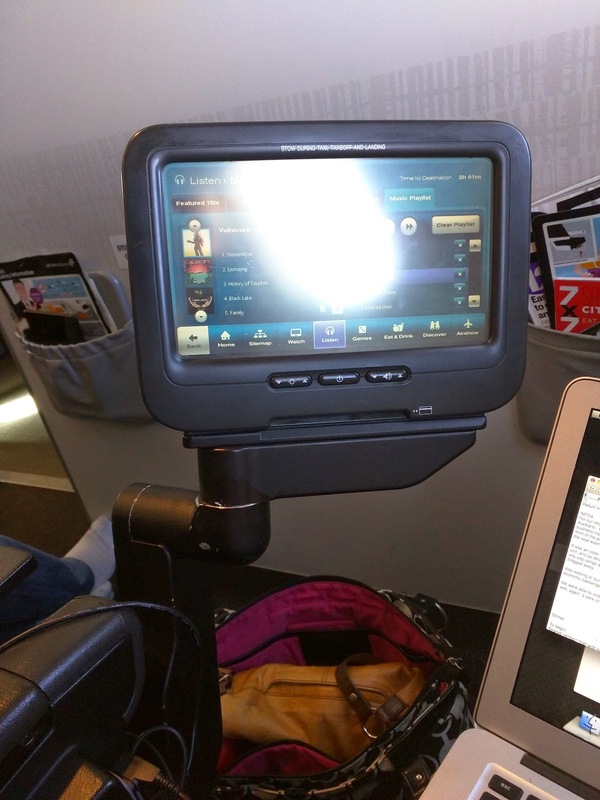 So, we had to "slum it" in "Works Deluxe", a rather glorified front-of-economy experience. While nothing was fancy, the food was shockingly good, and for a shorter flight, it really wasn't too bad. Since our ongoing flight was business class we were given “Works Deluxe” treatment on this flight, which meant that we were seated at the front of the plane (row 1), and the middle seat was not assigned a passenger. The seat still exists, with an immovable arm rest in the way, so our seats weren't any wider or different from the rest of the cabin in any way, just a little more elbow row. I supposed this allows the airline to reconfigure with as many rows of "Works Deluxe" as people are willing to purchase? Waiting at our seats were bottles of water, which it turns out were going to be prized possessions, as regular economy passengers would need to wait quite a while for drink and meal service. The aircraft was certainly older, with a very clunky entertainment unit, but, hey, at least there was an entertainment unit? As Works Deluxe passengers we were given decent headphones. I queued up a playlist of silly pop songs from the music menu and rocked out. Ojan may or may not have caught me dancing in my seat as I blogged away. There was a USB port, but no regular power, so I could charge my phone, but not my laptop. 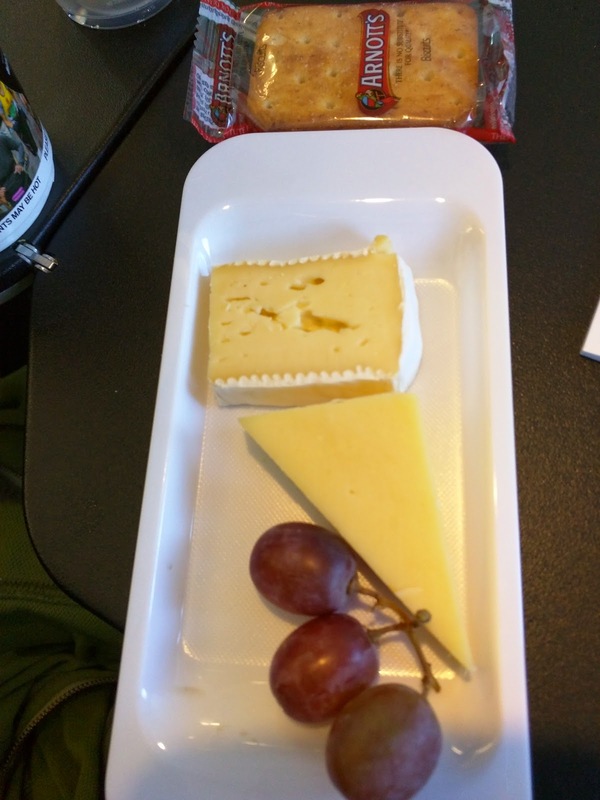 Since this was basically an economy flight, I had no hopes for the food, and didn't really plan to eat on the plane. I began my day with a rather insane feast for breakfast at my hotel around 7am, as it was my final chance to utilize the crazy breakfast buffet at Mosiac Restaurant. I was beyond stuffed after my breakfast. The server even asked me if I was eating for two. Doh. A few hours later, at 9:30am, we were in the Air New Zealand lounge at the Sydney airport (a temporary lounge, otherwise I’d write a formal review of it). We arrived while it was still breakfast hours, and I couldn’t resist trying the muesli and various yogurts, because I did have a disappointing last serving of my precious bircher muesli in the restaurant an hour or so before. Sadly, the bircher muesli wasn’t good, it was just like cold soggy oatmeal with a few bites of dried apricot. But the yogurts were actually delicious, super creamy. One had berry compote mixed in, the other passionfruit. I didn’t try any of the hot food (scrambled eggs, beans, roasted tomatoes, etc), nor use the automatic pancake machine, or even dive in to the famous hot dog cart. I was still so full from hotel breakfast buffet that I managed to use restraint. But then at 10am, the breakfast was replaced with tea time. Out came a huge assortment of fresh baked muffins (sweet and savory) and fresh scones with whipped cream, along with finger sandwiches, soup, and cookies. I resisted for all of about 20 minutes. 10:20am, and it was time to feast ... again. I stayed away from the soup, sandos, and cookies, but … it was impossible for me not to try the other items. I actually adored the cheesy savory muffin, with olives, herbs, and sundried tomatoes. They had both regular and gluten-free versions, and the gluten-free one was truly tasty. I also went for a couple sweet muffins, a regular banana muffin that was dry and not tasty at all, and a gluten-free pineapple muffin that I also enjoyed, with huge chunks of juicy pineapple throughout. 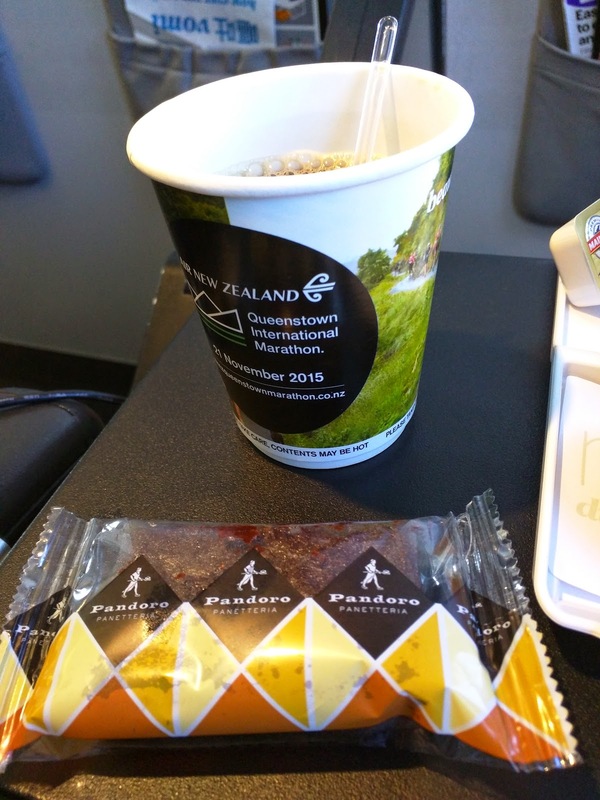 Air New Zealand really rocks the gluten-free baked goods! The scones were lackluster: served warm, but were basically just biscuits, the jam alongside was just packaged cheap strawberry jam, and the whipped cream was fluffy but not sweetened. So yes, after a huge breakfast buffet feast at the hotel, another breakfast in the lounge, and then a huge pile of baked goods, I got on this flight where they were about to serve me economy class lunch. I could care less. I also planed to just eat more when we reached the Auckland lounge again, as I was impressed with the breakfast when we swung through on our way to Sydney. Plus, I knew we'd have a long dinner service on the next flight. We certainly weren't going to starve. Still, I was of course curious, and a rather bored captive audience. 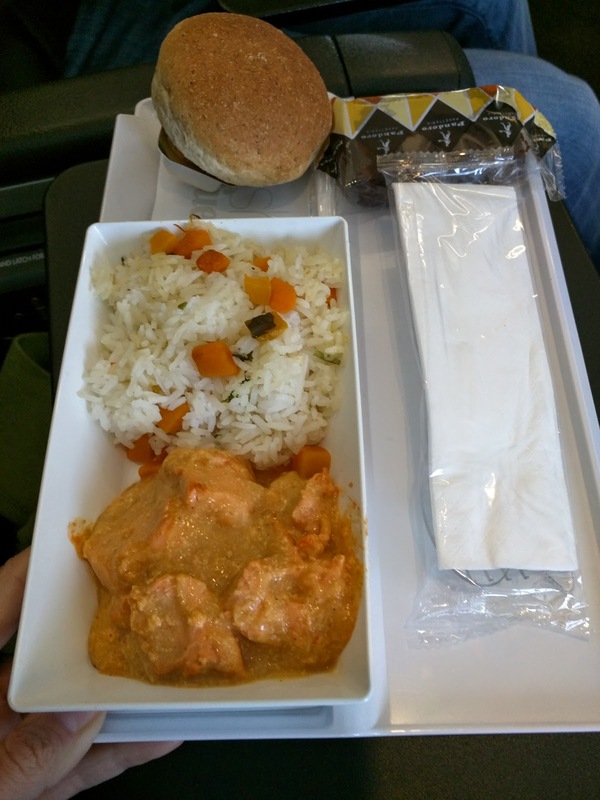 Meal service began the standard 1 hour into the flight. As Works Deluxe passengers a meal was included; for those in economy basic sandwiches were available to purchase. They didn't even have the option to purchase any real hot food! There was no menu provided. We had the choice of a hot meal or a cold meal, served from a cart rolled down the aisle. Both meals came on plastic trays, with plastic silverware, and a packaged dessert. It wasn't looking promising. Hot Meal: Thai Chicken Curry. Ojan opted for the hot meal, Thai chicken curry with rice. I snuck a bite of the sauce, and it was actually kinda flavorful. Since I don’t like chicken I didn’t try it, even though Ojan insisted that it tasted like salmon (which, I’d obviously prefer, but uh, chicken shouldn’t taste like salmon!). It was served with rice with little cubes of not-cooked-enough squash. Both meals also came with a roll, served hot, with a pat of butter on the side. We didn’t touch ours. Cold Meal: Salmon Salad with Cous Cous. Curiosity got the better of me, so I opted for the cold option, described simply as “salmon salad with cous cous”. I still am not sure why I ordered this. I was beyond full. And, given the description, I expected a mixed greens salad with a piece of overcooked dried out fishy salmon perched on top, perhaps scattered with some token cous cous. It was totally not what I was expecting, and ... it was good! Shockingly good. And clearly, I wasn't just hungry and thinking anything tasted good. The cous cous was mixed with herbs and red onion, and was super flavorful. On top was a ton of crème fraîche, which, perhaps is what I loved. Under the cous cous was a base of mixed lettuces, all actually still a bit crispy, not limp or wilted. The crème fraîche mixed in really well, creating a super rich, creamy coating on the moist, slightly crunchy, cous cous. This was a tasty little salad, just on its own. And then the salmon. Not the chunk of cooked salmon I expected. Instead I found slices of beautiful smoked salmon. 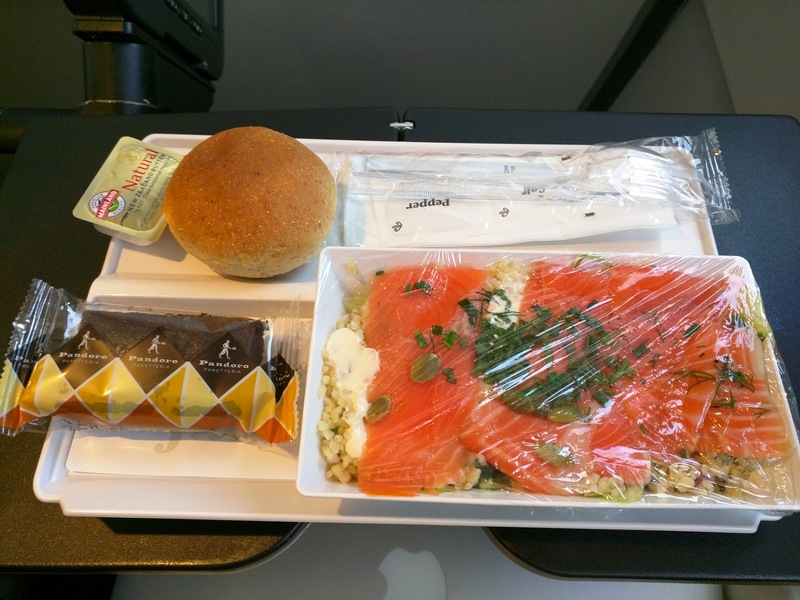 The smoked salmon was actually far better than what we had in the breakfast buffets all week. It was smoky, it was flavorful, it wasn’t fishy, it wasn’t fatty. It too went perfectly with the crème fraîche. I was so full, but I devoured this entire plate. I kept saying, “ok, self, you are so full, stop! Just one more bite!” I told Ojan to take it away from me, and then grabbed it back. And then it was gone. I really can’t explain how it was so good. Nicely done, Air New Zealand. The beverage selection was basic soft drinks, a few complimentary alcoholic drinks, and tea or coffee. I opted for a decaf, which was instant, but not too gross. Served in a paper cup. The dessert included on our trays was a packaged brownie. It was awful. Ojan likes brownies and chocolate, but also didn’t bother with a second bite of one of these. It was strangely moist, as in, moist since it was in a plastic wrapper and had been cold, and condensation built up inside. It was very dry otherwise. No chocolate chips or bits of anything to save it. Just really, truly not good. I managed to scrape up a few more bites of crème fraîche for “dessert” instead. 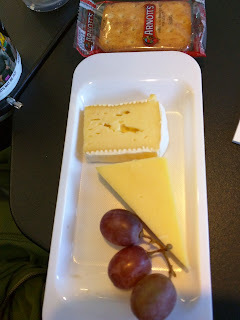 I was shocked about 30 minutes later when cheese platters were brought to us, featuring brie and cheddar, a few red grapes, and some Arnott’s crackers. I had zero interest in more food at this point, so I skipped it, but Ojan tried the cheeses. He seemed unimpressed.